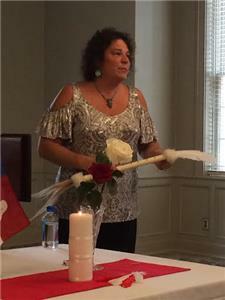 Nancy Ward Chapter, NSDAR heard remarks from Debra Yates, a direct descendant of Nancy Ward, at their September meeting at Mountain City Club. Ms. Yates is the author of the book “Woman of Many Voices”, a biography of Nancy Ward, Beloved Woman of the Cherokee. She is also actively involved in the restoration of the landscape at the Nancy Ward gravesite near Benton, Tn. Pauline Moore, Nancy Ward Chapter member is the Cherokee District Chair for the Nancy Ward Gravesite Landscaping Project that is supported by the 13 DAR chapters in the Cherokee district. 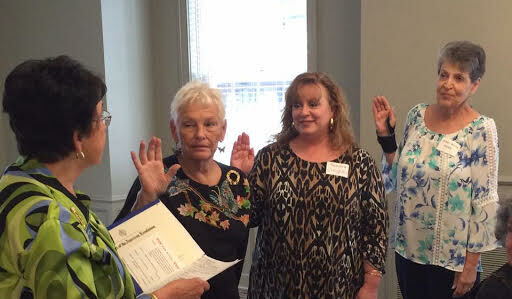 The chapter meeting also included the induction of three new members, Patsy Durkee Boles, Sandra Brantley Creighton, and Mary Aleta Wooten Word. Regent Natalie Blackwell awarded certificates from the National Society received over the summer. The chapter also collected pet supplies for McKamey Animal Shelter to help care for the animals who were evacuated from Texas during Hurricane Harvey.